Paterson Through Time ~ The History Girl! Paterson was the gem in the crown of the American Industrial Revolution, a city of unmistakable value, not only for its industrial production, innovative design and inspiring pioneers, but for its unyielding strength, surviving numerous floods, fire, a tornado, and the crime and poverty that still plagues its people today. Paterson has always been rich, not in terms of monetary value but in the spectrum of cultures reflected by its ever diverse and growing population. Paterson was one of America’s first centers of industry and has a proud history of firsts in American business: Samuel Colt manufactured the first Colt .5 revolver in Paterson in 1836; water-powered cotton spinning mill (1793); continuous roll paper (1812) and the Rogers Locomotive Works which helped fuel western expansion through the transcontinental railroad (1837). Alexander Hamilton walked the paths near the Great Falls and dreamed of an industrial city to break its ties with England; Pierre L’Enfant, creator of the Washington, D.C. streetscape, created Paterson’s industry-crucial raceways. Vice President Garret A. Hobart came from Paterson as did Lou Costello of Abbott and Costello fame. It was home to Larry Doby who in 1947 broke the color barrier in the American League, moved to Paterson in his early teens and became a legend here. 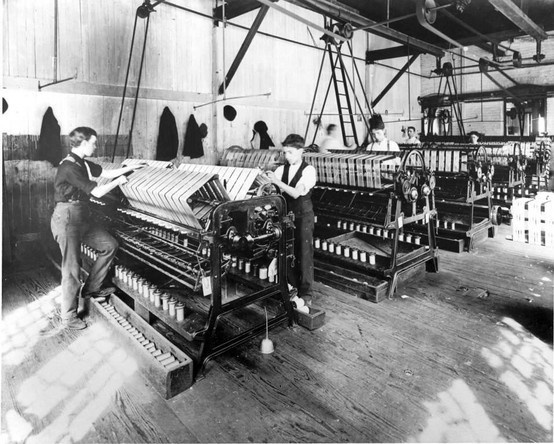 Children working in a Paterson textile mill. The silk mills and other textile facilities sprang up. Owners made their fortunes; workers, often immigrants, made a living. Still known as the Silk City today, prominent industrialist John Ryle successfully proved that weaving silk could be a profitable business nd set out to build international recognition for his products. Paterson hummed with the silk industry and was an international melting pot thanks to a constant influx of workers and immigrants from around the globe. In 1913, seeing its share of labor unrest, the Industrial Workers of the World (IWW) staged the Paterson Silk Strike, fighting for an eight hour day and other concessions from factory owners and prominent industrials. It was out of this cauldron of activity that an entire generation of achievers emerged. Among those born in the 1920’s and raised in Paterson were poet Allen Ginsberg, Jazz guitarist Bucky Pizzarelli and Lou Duva, a famous boxing manager and promoter. Paterson was central to poets like Ginsberg and William Carlos Williams, the beauty of the Great Falls an inspiration celebrated in verse. Main Street, Paterson, NJ circa 1908. It was the launching point for many in public service such as the late Senator Frank Lautenberg, Congressman William J. Pascrell, Jr., Senator Robert Menendez. And it was a sure fire political stop for everyone from Hoover to Eisenhower to Kennedy’s both JFK and Ted; Reagan, Carter, Bush (George H.W. Bush) and presidential hopefuls, Walter Mondale and Gary Hart. Martin Luther King Jr. visited the Community Baptist Church just before his assassination in 1968, Gerald Ford, standing in the rain at the Great Falls, where Alexander Hamilton had a picnic during the Revolution, and designated the 119 acres of land a National Historic Landmark in 1968. In March 2009, President Barack Obama signed into law the Paterson Great Falls National Park Act, designating the Falls the 397th National Park. The industry that grew around the Falls is long gone, but the history remains. Both nature and man played pivotal roles in Paterson’s founding and living legacy. Of the many small cities with a deep connection to some of the most compelling chapters in American history, industry and social change, Paterson is not to be overlooked. Paterson is a unique city in the New Jersey landscape. Once a hub of American ingenuity and industrial production, it slowly relinquished that role as mechanization and cramped space led industries out of the cities and into other parts of the United States. The city of Paterson tells a story of a planned city built on industry to supply a nation with a variety of finished goods and products and the ingenuity that propelled the United States to become an industrial superpower well into the 20th century. Third largest city in New Jersey and the county seat of Passaic County, Paterson has always been home to a working class of many different cultures and creeds. Of the many small cities with a deep connection to some of the most compelling chapters in American history, industry and social change, Paterson is not to be overlooked. Both nature and man played pivotal roles in Paterson's founding and legacy. Marcia Dente was a life-long resident of the city of Paterson until 2007, when she moved to South Jersey. For more than fifty years, she lived on Front Street, approximately two blocks from the Great Falls, and watched over that span of time as the area surrounding the Falls developed into a national natural resource, a historic landmark, a state park and, in November 2011, a national historical park. Long before the Falls had any recognition, she played in the area behind the Falls and walked across the Wayne Avenue Bridge every day on her way to high school. She watched, painted and photographed the Falls as the water cascaded over the rocks from the Passaic River. Dente retired in 2005 after forty-five years of service to the City of Paterson. Seventeen of those years were spent working with the Paterson Free Public Library, and the remaining years were spent working with the Department of Public Works. During the years with the library, she was the staff artist in the publicity and art department and worked on many projects, which included poetry contests, publishing poetry anthologies and judging art contests. She primarily assisted Mary Ellen Kramer, wife of former mayor Lawrence "Pat" Kramer, in the creation of the Great Falls Festival in 1971, which continues to this day. Little did she know that when she was transferred to the Department of Public Works in 1977, she would continue to be involved in the planning stages of the festivals, assisting the late Ruth Hirshberg, director of special events; Paul Vetreno, superintendent of Parks and Shade Trees in the 1970s; and, later on, with other directors of the Department of Public Works and city officials. 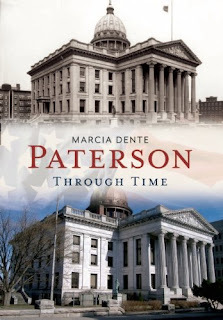 She is the author of Great Falls of Paterson, published in 2010 and Paterson Great Falls: From Local Landmark to National Historical Park, published in 2012. Purchase a copy of her latest book, Paterson Through Time.